Who could ever imagine the intricacies of the ministry of BFF when we began over 2 1/2 years ago? Certainly not us. The web site itself has, as of today, 11,748 files. Can you imagine how hard it is to keep all those files organized, let alone creating them?! This is the complicated organzational system that keeps the roughly 1,100 web pages supported and serving more than 350 people each day around the world. We just started teaching a Parenting class at Pittsburgh Chinese Church at Perry for the fall. Does that sound familiar? It is where Paul pastored for nine years. Paul and Linda enjoy getting re-acquainted with many old friends and as well as meeting new ones. The first class had 30 in attendance. The early arrival of fall has given Paul time to catch up on his many summer projects. He is touching up the Parenting series, finishing off two smaller series on magic and demons, publishing a BFF Library, editing and developing Cross Training basic discipleship materials and developing other miscellaneous articles like an introduction to the Sermon on the Mount. 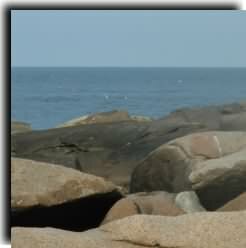 Last month, Linda and I had the opportunity to take a one day get away along the northern coast of Massachusetts. We not only haunted our old tennis courts in Lynn but got to walk along the gigantic rocks at Halibut Point State Park near Gloucester. Biblical Foundations for Freedom has been on the web for over 2 1/2 years. We are thankful for God's special work in each step of the creation of materials that are strengthening the faith of God's people worldwide. Refreshing time with wife and family as we visited family and friends. Safe traveling. Thank the Lord for a translator to finish off the Parenting series in Chinese. Thanks for those 350+ people that come to BFF's website each day. Thankful for special grace speaking on an introduction to the Sermon on the Mount. Praise God "THE FLOW" has had good reading. We thank the Lord that one day we actually had 2000 pages read in one day (our goal for year). We are averaging about 800+ daily. Please pray for an extraordinary work in the hearts of the 18 families attending the Biblical Principles for Parenting series this. Quick healing for Paul's poison oak. It is very distracting. Pray for Pastor Stephen and others in India who are not only pastoring a church but developing their own leaders. Continued provision for BFF needs. Paul will be preaching several times this fall. For God to arise and cause a world revival to stir up His people to finish the quest of bringing the gospel around the world. For God to raise up two more Training Institutes by the end of the year.